Actor Narain remains closely synonymous to “Cherry-picks” as he scrupulously chooses his projects and roles, quite illustrious with diversified avatars in ‘Chitthiram Pesudhadi’, ‘Anjathey’ and even playing a deadly baddie in ‘Mugamoodi’. Although, the actor has been getting more offers, he has been sticking to the motto of picking the ones that would nurture his career graph eminently. 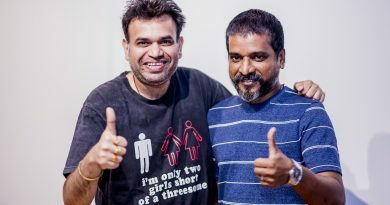 RUM is a spine-chilling horror tale is produced by Vijay Ragavendra of All win Pictures and helmed by debutant Sai Bharath with a star-cast featuring Hrishikesh, cousin of Anirudh (shot to fame playing Dhanush’s younger brother in Velai Illa Pattadhaari), Narain, Sanchita Shetty, Miya George, Vivek and Amzath Khan.